Currently, this module has no permanent scenery. It just adds to the distance the train travels during the show, and provides space for temporary scenes. 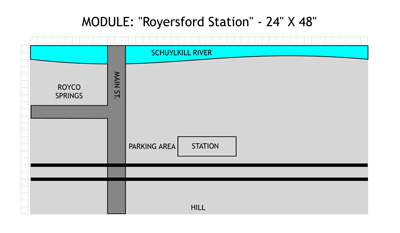 Plans call for this module to eventually be occupied by a scratch-built model of the train station in Royersford, our club�s home town. 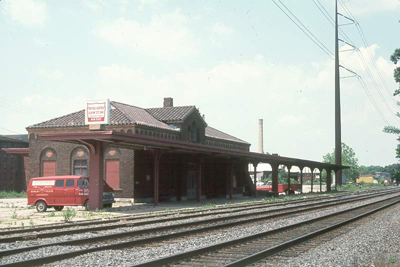 That station still stands along the Norfolk Southern (former Reading Company) main line, but is no longer in use as a train station. It has found a second life as a home to a pretzel bakery and a real estate office. Diagram showing the general arrangement of this module, as planned for completion. The real Royersford station. Photos and measured drawings will allow us to build an accurate model of this station on our display layout.